RETRO KIMMER'S BLOG: THE WALKING DEAD AND BREAKING BAD MARATHONS ON AMC! 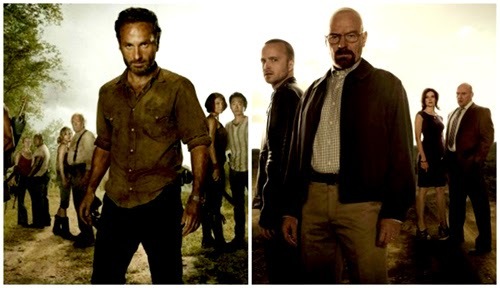 THE WALKING DEAD AND BREAKING BAD MARATHONS ON AMC! AMC has announced it will air two back-to-back marathons of its Emmy Award-winning original dramas Breaking Bad and The Walking Dead. A four-day Breaking Bad marathon, which kicks off at noon ET/PT each day from Fri., Dec. 27 through Mon., Dec. 30, will feature every episode from the series' critically acclaimed five seasons, making AMC the only destination for cable subscribers to watch every Breaking Bad episode for free. On New Year's Eve day, Dec. 31, at 9AM/8c, AMC will air a two-day marathon of The Walking Dead. Beginning with the pilot, episodes will air back-to-back in chronological order until 5AM/4c on Jan. 2, 2014.